There are many different types of telephone. A telephone that can be carried around is called a mobile phone or cell phone. These became popular in the late 1980s. It has become common for people carry mobile phones and in some places it is unusual to not have one. The majority are smartphones, which can be used as computers. Some mobile phones are able to make telephone calls using communications satellites instead of masts on the ground, which means people can make calls from anywhere in the world. In most countries there are public payphones. To use one, people pay with coins, a credit card or a prepaid card. Computers can use a machine called a modem or a Digital subscriber line router to talk to other computers over a telephone line. This allows a computer to connect to other computer networks including the Internet. Most countries have a telephone network. The telephones in one place are connected to a telephone exchange. The exchanges are connected together in a world-wide network. In less developed countries cell phones are used as a cheaper and faster way to connect the countryside to the network. Most telephones have their own number. Today, telephone numbers are about seven to ten digits long. In many countries, part of the telephone number is called the area code. Area codes are used to make sure the numbers are not the same in two different places. Areas have their own area code, and countries have their own country code. By the end of 2009, there were a total of nearly 6 billion mobile and fixed-line telephone subscribers worldwide. This included 1.26 billion fixed-line subscribers and 4.6 billion mobile subscribers. 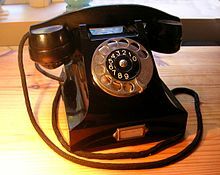 Wikimedia Commons has media related to Telephones. This page was last changed on 28 March 2019, at 14:30.